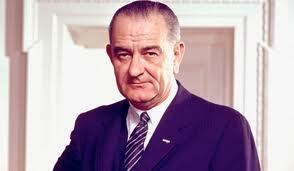 Today marks the 50th anniversary of the speech in which President Lyndon B. Johnson declared war on poverty. That’s dirimens copulatio, which is the “not only…. but” figure. Rhetoric is a tangled heap. The past 3000 years have allowed the magic word spells we call rhetorical figures to be defined and re-defined so many times that you often find multiple definitions for the same thing. Dirimens is the ultimate example because 2000 years ago Cicero was already disagreeing with Aristotle about exactly what it was. We’re not only going to do x, but we’re going to do y as well. Not only do people suffer from x, but they have to suffer y as well. You’ll not only win x, but we’re going to throw in y as well. Next time you’re making a presentation, try a dirimens copulatio. Not only will it emphasise your point, but it’s straight-forward as well. But be careful how you Google it. It’s surprisingly easy to mis-spell!